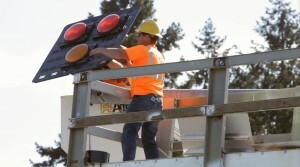 City combats pedestrian/vehicle collisions by upgrading crosswalks | Audio and video stories from Southwest Washington. The City of Vancouver is installing new pedestrian hybrid beacon systems on Mill Plain and 4th Plain. The hybrid beacons provide better notification to drivers when a pedestrian is crossing using a series of yellow and red lights. Pedestrians will now hear spoken commands to walk, wait or clear the intersection if an emergency vehicle is coming. In January, two women were struck and killed by a pickup as they crossed a street in a crosswalk near the VanMall. Last October, a man crossing Mill Plain Boulevard at Southeast 105th Avenue was hit and killed by a driver, who police said was distracted by texting. Clark County crash data says there have been over 200 injuries in pedestrian-vehicle accidents in the last three years, and at least 35 deaths in the last decade. Traffic laws have not changed how drivers address these new crosswalk systems. Vehicles must yield to pedestrians when drivers encounter these new lights.